The green acerola powder is a natural source of vitamin C.
Acerola measuring 1 to 2 cm in diameter, and resembles the common cherry, except that it is ribbed. The flesh is juicy and red-orange, nice and tangy flavor. Certification: ECOCERT BP 48 32600 L’ISLE JOURDAIN (FR-BIO-01). The highest levels of vitamin C from acerola, is achieved when the fruit is not yet ripe. In Brazil, where the tree is grown, the fruits are consumed in juice form. Acerola also called "Amazon Cherry" contains 20 to 30 times more vitamin C than oranges. Acerola is an excellent tonic. It is perfectly indicated to treat tiredness or prevent winter infections, such as flu or colds. 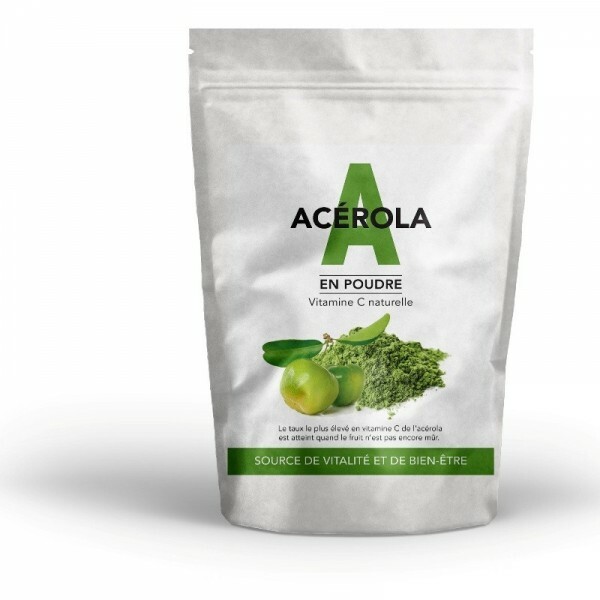 Vitamin C also promotes the intestinal absorption of iron, acerola is particularly well adapted to supplement spirulina consumption to help the absorption of iron in it. Finally, it is an excellent complement to diets low in fruits and vegetables, also recommended for smokers, whose needs vitamin C increased. In case of fatigue, intense physical effort or review. One tablespoon daily coffee (about 5g) will do you good. To keep fit 1/2 teaspoon daily coffee (about 2.5 g) will suffice. And in time? It depends on you in the first place. If you are tired, a 3 months cure will do you good.